It started with Ryan Lott was making music for ads. Now Emmy-nominated actresses star in his band's music videos. The Son Lux story is ever-evolving and all too-fascinating. For years, Son Lux was often referred to as a one-man-band consisting of founder/composer/vocalist Ryan Lott, who released his first album under that name in 2008. The wonderful At War with Walls & Mazes introduced the world to Lott's otherworldly compositions, which often feel like soundscapes more than actual "songs." 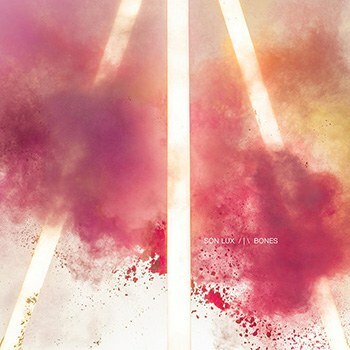 This changed with the release in 2015 of Bones which saw Lott invite percussionist Ian Chang and guitarist Rafiq Bhatia to become part of Son Lux. It's no coincidence that in the appropriately titled album, the band's fourth LP, the sound has become almost stadium sized, with tracks like "Your Day Will Come" and "Undone" combining melancholy with majestic arrangements one could almost describe as rock sounding. The band is in the midst of a tour that will see them bring their shows to the States in the spring of 2016, as of now they were kind enough to answer a few questions about Bones and the future of the band from their stint in Paris. Originally I expected Lott to answer all of them, I have to confess hearing back from both Chang and Bhatia made me even more excited to what's next for Son Lux. Ryan, you learned piano when you were young, as a method of discipline, but you've mentioned music wasn't a big part of your life. When you became a musician did you go back and try to "catch up" with all the music you'd missed during your childhood? Ryan Lott: I discovered music as I was discovering myself, or at least, what feels like the first sentient phase of me. Music became an important part of my life as I was establishing my own identity, distinct from my family's culture or preferences. So I didn't hear a lot of music early in life, let alone listen to it, but I quickly began to absorb a broad array of things in high school, and of course in college at music school. But I still had a lot of gaps in my experience of popular music. It wasn't until I was working in advertising, making music for ads, that I had to familiarize myself with a ton of stuff. My primary task for years as a staff composer at a music house was to emulate. In so doing, a gained an appreciation for things I had either dismissed early on, or had missed entirely. The process of making an album on your own, must've been very internal. How has it been to make music with a band, and actually discuss your thoughts with other people during the creative process? Have you found it hard to get out of your previous methods? Ryan Lott: It's been very natural, but only because the chemistry is right between us, and there is a foundation of trust. This means that every idea that comes to the table is a valid one, and could have potential to illuminate exciting new directions. I try to challenge myself to look for new ways to do things and think about things, so to the extent that Rafiq & Ian present a "shock to the system" of my process, I welcome it. Do you see your albums as precise concepts from the get-go, or pieces that come together the more you write? Can you give us some insight into selecting the tracks for each record. Ian Chang: In a way, it is a little bit of both. On Bones, there is definitely a theme of capturing and recontextualizing ephemeral moments, but that theme was born out of an intuitive process early on. It was something that the three of us were naturally excited about exploring together. You wrote We Are Rising in less than a month as part of an NPR challenge, do you find that setting goals like these helps you be more creative or just puts you under stress? Ian Chang: Ryan generally works really really fast, and he'll make multiple versions of a song before going with one. I think that We Are Rising forced him to trust his first instincts with his ideas, and I'm glad he did! Bones is surrounded with concepts of "social uprising". Was there a political theme in your mind when you started composing this? Ian Chang: There wasn't. In fact, the lyrics are typically written last. With each album your sound seems to grow, perhaps I'm wrong, but I could detect some "stadium anthems" in Bones, would you say that as your career moves on, you think of playing larger venues and that affects your sound? Ian Chang: When making the album, we don't consciously consider the live show, let alone the type of venues we hope to be playing. However, I do think that our chemistry live, and the resulting performances we play have a subconscious affect on how we express ourselves on record. One example is how Ryan discovered different ranges of intensity and expression from his voice while touring Lanterns in 2014. This discovery really shows on Bones. Your live shows tend to have a lot of improvisation, is it hard to reach a compromise between doing new versions of pieces from the album to satisfy your own creative need, and perhaps trying to satisfy fans who expect to hear a live replica of the album? Rafiq Bhatia: We feel that the record and the stage are two totally different mediums: what works well in one doesn't necessarily translate elegantly to the other. We also see the recording as a sort of midpoint in the creative process, and take some solace in the fact that the songs will continue to evolve in performance. The challenge becomes finding a way to balance our love for surprise -- which is central to the Son Lux ethos -- and our desire to maintain the parts of the original that work best on stage. But I think our audience is self-selecting in a way; they also enjoy confronting the unexpected. For that reason, we often find that our fans thank us for departing significantly from the records when we play live. Your score for The Disappearance of Eleanor Rigby was absolutely breathtaking. I remember naughtily taking out my phone at the end of the press screening to Shazam the piece from the credits. I liked how the use of electronica was so organic, and worked so perfectly for the sweeping romance. Do you find that people tend to have misconceptions about electronica sounding distant? Is your intention to prove them wrong? Rafiq Bhatia: For most of human history, music has been produced by the direct actions of human bodies, of people affecting their environments. Cognitive science has shown us that when we listen to music, we imagine the movements that produced the sounds and rhythms we are hearing. To the extent that electronic music is inherently dissociated from that process, it can indeed feel disconnected. Of course, it also has its strengths in captivating people, including sonic power and presence that can have a more physical effect. One only needs to experience the directness of loud, pure synthesized sub bass rattling one's ribcage for a moment to know how visceral it can be. With Son Lux, we try to marry the strengths of the natural, acoustic medium with those of the electronic one. Many of our "electronic" elements actually started out as a person playing an instrument in a room. On Rigby, for example, a key texture came from two-note chords that I tracked on the guitar, looped, and reversed, which Ryan then mapped to a keyboard and played back at different tempos to create a new instrument. There are traces of humanity to subconsciously cling to. Somewhere in there, you can perceive the fingers against the metal. I love the vocals in "You Don't Know Me", and was surprised to learn they were scratch vocals you recorded while you were sick. Now every time I listen to the song, I remind myself to take some Vitamin C. Do you find that the more we know about how art we love is made, the less its emotional power becomes? Rafiq Bhatia: We have actually historically refrained from providing these kinds of details about our songs. The more you know about the artist's intentions, the less room there is for your imagination to create its own, personalized account of what a song is about. But I think we've been saying more than usual lately in part because, while it remains of paramount importance to us that every individual be able to have her own unique relationship to the music, we also know that we aren't living (or creating) in a vacuum. Sometimes we reveal a smaller detail about the process in the hopes that it will inspire further contemplation, while also not taking away from the individual experience as much as a bigger statement about a song's context would. Why would we choose to use those strained vocals, and to draw your attention to the fact that they are strained? What might that decision suggest about the nature, or urgency, of the message?